About two kilometers from the Sakkarah necropolis can be found the five pyramids of Dahshur, three built of stone and two of brick and all equally impottant. The most northerly one, in brick, is that of Sesostris III (XIIth dynasty) which was once faced with sculpted Tura stone. The most southerly are the pyramids of Amon-Emhat II and Amon-Emhat III. The former, in whose burial chamber was found a splendid collection of jewels, is of stone and latter is of brick. 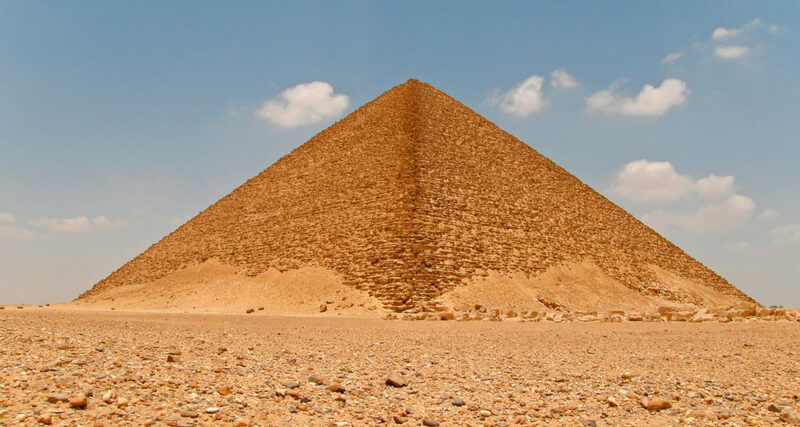 The other two pyramids were both constructed by Snefru, the first Pharaoh of the IVth dynasty. The length of the sides of the base of the one called the <<Red Pyramid>> is more than twice its height (213 meters as against 99 meters). The other one, recognizable from a long way off because of its unusual appearance, is the so-called <<Rhombodical Pyramid>> which is also the best preserved of the necropolis. It owes its name to its odd shape, the slope of the faces changing, a little more than half way up, from 50 to 43. Another odd feature is that it has two entrances, one to the west and one to the north, which lead to two stepped covered chambers.